Harry Styles successfully delivered a passionate performance with a retro and idiosyncratic charm that made it an utterly endearing night to remember. On Sunday the 29th of October I was lucky enough join the pop superstar and my one true love, Harry Styles, for his first night at the Eventim Apollo on his solo tour. After battling through the crowds outside of the venue and spending all my money at the merchandise stall, I managed to find a place in the centre of the crowd ready to see the former One Direction front man. It is well known that 1D fans are a force of nature and this was evident even before his appearance on stage, as the venue brimmed with the excitement of thousands of fans. As the lights dimmed and the harmonies of his first song of the evening, ‘Ever Since New York’, filled the venue, Harry’s silhouette appeared on a silky pink curtain that covered the stage. The curtain dropped, the excitement of crowd shot through the roof, and thousands of screaming girls began chanting Mr Styles’ name at the top of their voices. The tattooed heart throb stepped out onto the stage wearing an extravagant pastel blue metallic suit and playing a beautiful Gibson ES-350. His look was very retro, and reminiscent of the late great Elvis Presley, while his vocals evoked those of the iconic David Bowie. Harry’s authentic and idiosyncratic style was truly praiseworthy, and many of his songs reminded me of the classic rock tunes that my mum and dad would have listened to when they were younger. I can’t listen to his song ‘Women’ without thinking of Elton John’s ‘Bennie and the Jets’. The evening was filled not only with good music but with a lot of love, too. Harry wore a rainbow flag over his glorious suit and told fans that they should do, “whatever makes them happy”. Positivity and being who you are was clearly a key message that the superstar wanted to convey, and this only made the evening even more commendable. Not only did he perform tracks from his debut album, Harry Styles, Harry also treated fans to two One Direction songs. Firstly he sung a personal favourite of mine, ‘Stockholm Syndrome’, and then went straight into a rock rendition of the band’s most well known hit, ‘What Makes You Beautiful’. He also covered Fleetwood Mac’s ‘The Chain’, which he has previously performed on Radio One’s Live lounge, as well as Ariana Grande’s ‘Just a Little Bit of Your Heart’. Overall, Harry’s concert made for an uplifting evening with an endearing retro appeal. 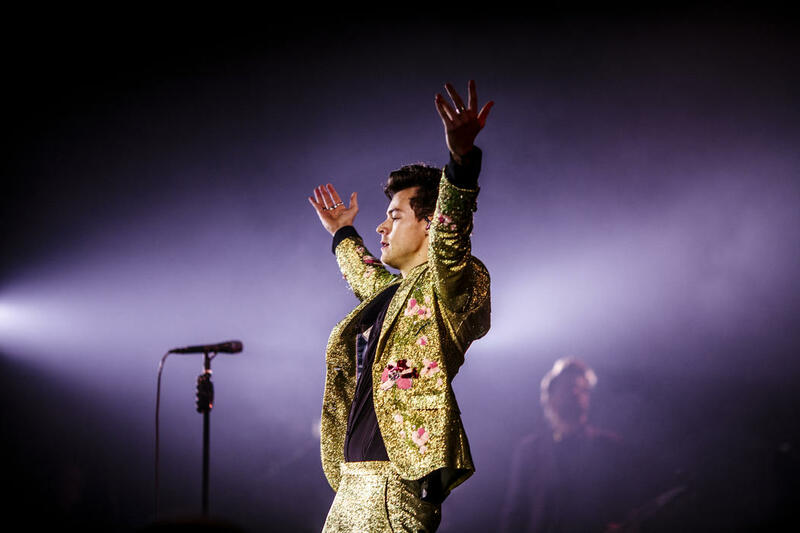 The concert was filled with fun and a great deal of energy from the start, and Harry captivated fans with his cheeky remarks and his Mick Jagger dance moves. I have been a Harry super fan for a very long time and I can wholeheartedly say that this evening only fuelled my love for him and his many charms.